Jess Regelson has been making mosaics professionally since 1997. She has created private installations, including shower floors, backsplashes, hearths, etc. In between commissions, she can be found making mosaic art and furniture in her studio in Pawtucket, R.I. In June, 2006, she was the recipient of a "citizen's citation" from Mayor David Cicilline of Providence, in honor of her work creating murals with schoolchildren. She has worked on fifteen murals in the state of Rhode Island, both indoors and out. Mosaic pieces created purely for their aesthetic qualities. 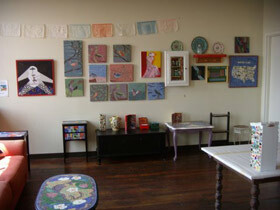 Pieces include wall hangings and new 3-dimensional mosaic sculptures. Mosaic commissions completed for private clients, including fireplace backdrops, showers, murals, countertops and patios. Mosaic maps are a fun way to express the unique traits that make a place what it is. From world maps to fun Rhode Island maps, often including found objects unique to each location. Large-scale mosaic murals with a theme, often created with public schoolchildren as a community or school improvement project.